To mark its 60th Anniversary, Mercian Cycles of Derby, England, has produced a run of 60 special edition bicycles. 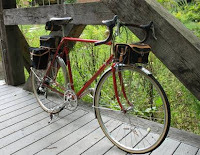 One of them was recently featured on the Velo Orange blog. It is owned by Mr. Kyle Brooks, a teacher in Medina, Ohio, who has a nice stable of bikes already. You can see more photos of the build-up here and here. Mercian continues to build all its bicycles by hand, and the 60th Anniversary version is a tribute to the firm's artistry in steel, with gorgeous lugs and beautiful welds. Mr. Brooks has built up the bike with Campagnolo parts, but has avoided anything with carbon it to retain a retro look, and a stylish one. The bike is built for touring and is so pretty that if I ever find a space I might think of getting a Mercian myself so that I can admire those wonderful lugs. But I think I would have to go to the shop in Derby to place the order personally. Mercian has a page devoted to its own history, and you can also read more about the company at the comprehensive website Classic Lightweights UK. After going to Cirque du Cyclisme earlier this year I have fallen in love with steel frames again and ordering a Mercian gives you the benefit of a new frame with all the style of the old. Gateau Gatineau: Another Slice for Me!